I know, I know … no more Imagifiers in the Beta Codex. Anyway, at this years Las Vegas Open, we got another glimpse on the new Sisters of Battle. And this one is holding a Simulacrum Imperialis. First off, it’s stunning. Its rich in detail, atmospheric and it has the exact right size for Warhammer 40k – too big 🙂 Honestly, carrying this thing around seems quite a task. Anyway, since we are in the grim dark, I love it and it seems fitting its purpose. Taking a look at the details, we can clearly see a more subtle unit compared to the first sister we were shown. Less seals, chains, fleur de lys and so on. And that’s fine, since this battle sister might be part of a simple troop. The only thing that bothers me a little, are the gloves. The first sister has some sort of metal / armored gloves, while these here are simple leather. Never been a big fan of that, but that’s really just a detail personal taste. I can’t wait to see a real model, painted and ready for battle! Unfortunately, this is all the news we got from LVO to date. Not sure if there are more seminars following, but I doubt it. We promised we’d keep you up to date every step of the way, and so far, we have, with previews and even the chance to playtest the rules yourself. 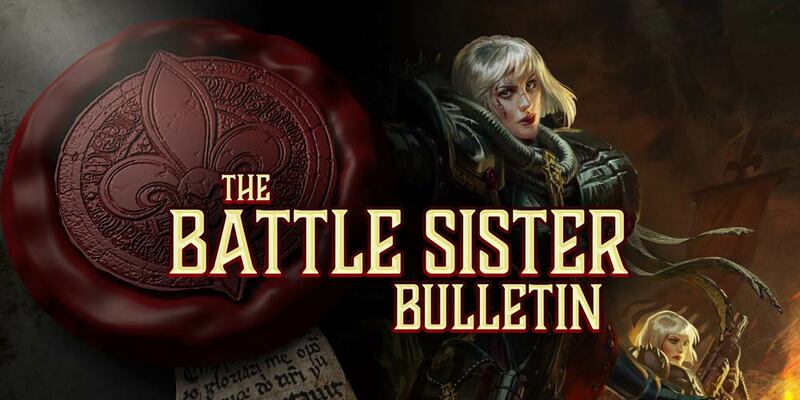 Continuing in that vein, we’re very excited to announce the Battle Sister Bulletin, a regular series – right here on warhammer-community.com – that’ll be packed with previews and insights until they arrive. Think of it as your one-stop shop for the very latest on the Adepta Sororitas. So this article is obviously quite short, but I’m looking for much more news in the near future.